To create the fluffy white owl feathers I provided lots of torn pieces of old Anaglypta wallpapers with different textures. Older children would be able to tear the wallpaper themselves, but it is a very tricky task for little ones who are still mastering fine motor skills. 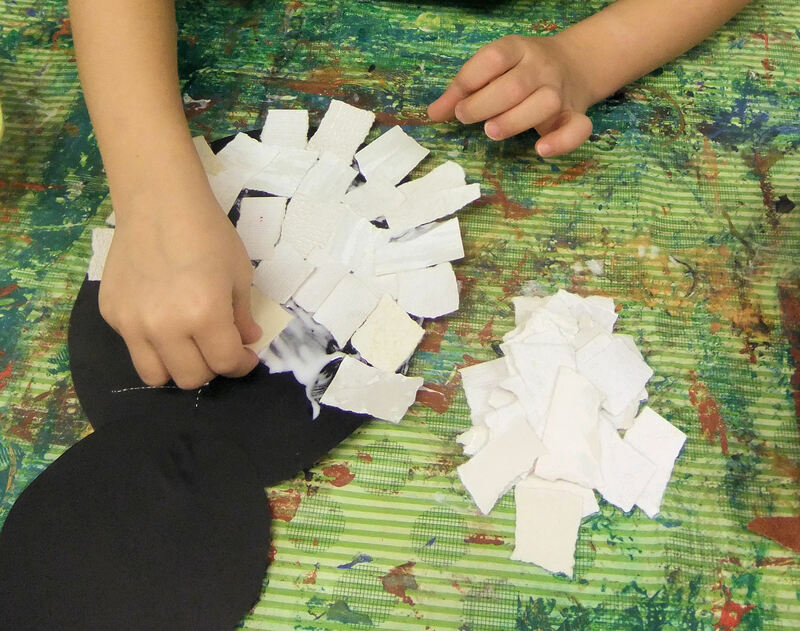 The children glued together a circle and an oval of black paper to create the owl’s head and body, and then daubed PVA glue all over the surface before covering it with little paper pieces. I encouraged them to overlap the pieces and allow them to stick out around the edges. A small triangular beak was cut out from black paper and eyes were made by drawing on yellow paper discs with a black marker pen, and gluing them inside small muffin cases. To complete the picture, a brown wallpaper ‘branch’ and the snowy owl were glued down onto a blue background and the children used their fingers to add some snow flakes.